As part of a final biology exam, Utah Electronic High School asked students to determine whether a woman in a specific situation should have an abortion. A. The parents should wait until the baby is ready to be born, then re-do the genetic tests to see if the results have changed. B. The parents should consider many aspects of this decision including religious beliefs, financial burden, the effect on other family members, the mother’s health, the doctor’s recommendation, and the life of the unborn child, and make the best decision for everyone. C. The doctor has more scientific knowledge. The parents should follow the advice of the doctor and have the abortion. D. The parents should consider the wishes of the mother, since she will carry the greatest responsibility for the child, and do whatever she wants. On Wednesday, an image of the question was posted online by Utahns Against Common Core, after Electronic High School sophomore Cody Okerlund took a picture of it with his phone. Oak Norton, an activist affiliated with Utahns Against Common Core, says the question potentially violates Utah law by testing students’ moral, political, or religious beliefs. 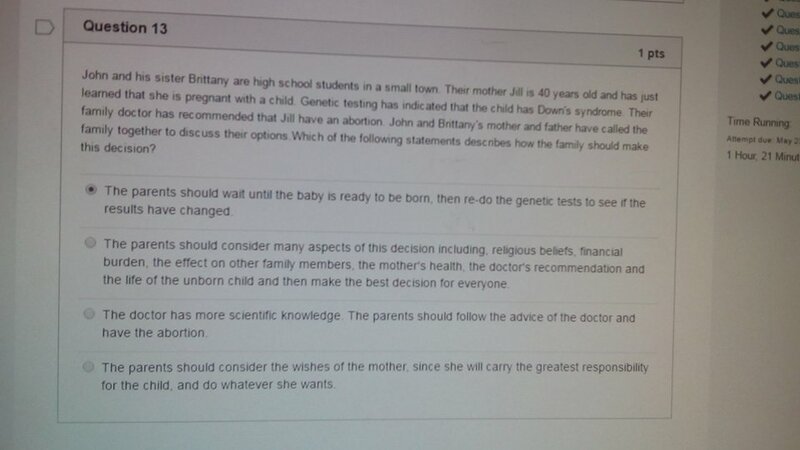 Norton also noted that the answer options do not include an answer that respects the life of the preborn child. According to The Salt Lake Tribune, the question was removed from the tests after parents voiced their concern. EHS principal Kathleen Webb says it is unclear who wrote the question, but that it does not appear to have been written by the school’s biology teacher. Webb called the question “obviously inappropriate,” and said she intends to investigate the situation.